Manathakkali is known as "Makoy" in Hindi and "Black Nightshade" in English. This is a simple kuzhambu prepared with manathakkali vathal. 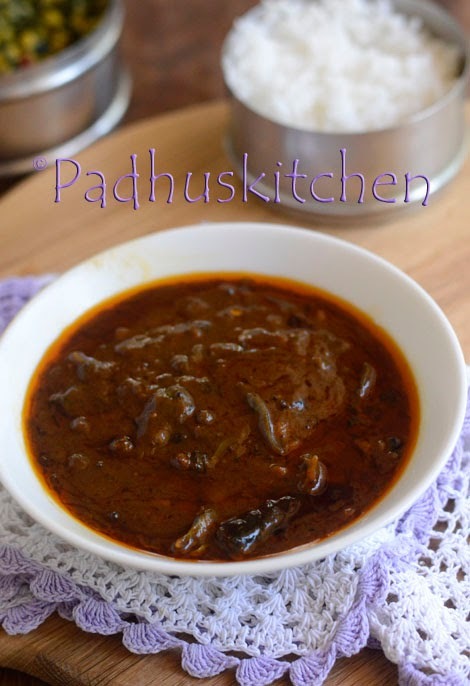 It is a typical Tamil Brahmin Iyer style recipe without onion and garlic. Today we will learn how to make Manathakkali Vathal Kuzhambu following our easy recipe with step wise pictures. Soak tamarind in 2 -2 1/4 cup of hot water for 20 minutes. Extract its juice and discard the pulp. I have used old tamarind. I suggest using old tamarind for vatha kuzhambu as it will taste good. If using new tamarind, you might need more tamarind than mentioned. Keep all the ingredients needed ready. Heat oil, add mustard seeds, when it splutters, add fenugreek seeds and tur dal, when dal starts changing color, add hing, red chillies and saute for a few seconds. Then add manathakkali vathal and fry for a few seconds. Then add salt, sambar powder and curry leaves. Saute for a few seconds and then add tamarind extract (You will get around 2 cups of tamarind extract). Mix well and cook on medium flame until it thickens and leaves oil. It will take around 20-30 minutes to thicken. As it cools it will thicken further, so do not allow it to become too thick. Serve with rice, any vegetable stir fry or vegetable curry and sutta appalam. This kuzhambu keeps well in the refrigerator for a week. If you are busy, you can make it over the week end and store it in a container in the refrigerator. You can double this recipe to serve 8 persons. A very authentic recipe!! !similar to what my mom makes....good click!!! Good one and authentic recipe. Padhu, Is that a mud kadai you used? Looking very nice. Why can't you write health benefits of using mud or clay pot? That will be definitely useful to everyone. Mouth watering. It brought all old memories back after I saw your blog. Thank you so much, padhu. Yummy even while reading. Going to prepare for today's lunch. say if I want to make 24/32, say I increase ingredients by 6 to 8 times. Does it increase my cooking time as well? You can. It will increase your cooking time. Thank you mam ! I make a regular visit to Padhuskitchen and never disappointed. At 85, I still cooking and you are areal help ! V.Balasubramaniyan , nashikbala@gmail. Wow.. it smells as it done by my mom Thanks.